We travelled to Tamworth on Thursday 7th to meet with Ian Smith, Australian Trade Commissioner to the USA, based in Chicago. He heads up Austrade's Agribusiness business in the USA. We first met Ian when we were on our self-funded soil carbon study tour of the USA last October. He introduced us to the Chicago Climate Exchange (CCX) which placed an order with us for 25,000 acres of till to no-till soil (which is traded on the CCX already). They also trade crop to pasture. 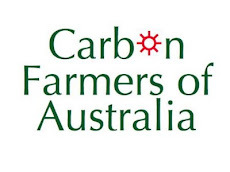 The only specification was that we had to provide the CCX's preferred aggregator, the National Carbon Offset Coalition in Montana, with 'peer-reviewed data' which indicated the range of soil carbon scores likely to be achieved under a change from till-to-no-till in Australia. The Americans have a paper by Dr Rattan Lal, specifying a range of soil carbon increases identified in a number of peer-reviewed papers. Australian farmers are not so fortunate. As reported in our last post, we have found a gap in the data sets used by the Australian Greenhouse Office to formulate policy and advice to governments. The vast majority of sites chosen for measurement, reported in Technical Reports 34 and 43 of the National Carbon Accounting Scheme program, appear to be business-as-usual, carbon-depleting, conventional farming situations. "Regenerative land management" was an alien concept at the time. The night before our meeting with Ian Smith (whose brother Norm farms two properties away from us along the back road to Wellington) Daniel Kiely gave a presentation at a NSW Farmers' Association Carbon Seminar in Tamworth. We touched base with John Williams, Commissioner for Natural Resources who wants to help us to develop our official links with government. 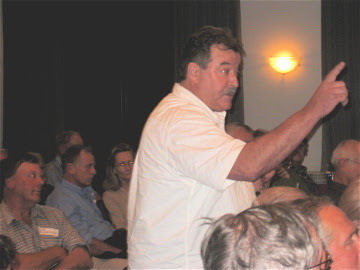 We also heard a passionate speech from the floor by Peter Spencer, a landholder from Shannons Flat, near Cooma NSW. He is chief spokesperson for the farmers group seeking $10.5billion dmaages from the Commonwealth and State Governments for the carbon credits or compensation they should have received for being restrained from clearing "native vegetation" or "woody weeds", depending on who's doing the talking. The PM and his ministers have been claiming Australia will meet its Kyoto committments on the back of that forgone land clearing. As recently as last Wednesday night on ABCTV's 7.30 Report, Treasurer Peter Costello said these words: "This was all designed to stop land clearing and we stopped land clearing, and it's helped us to meet our Kyoto target. If I may say so, Australia actually did something practical... Australia is actually one of those countries that is on track and is on track because it actually did something quite positive, that is, stopped land clearing." So the Federal Government has "nationalised" the carbon credits that would have been worth $5.5bn if traded on the NSW Greenhouse Gas Abatement Scheme. Could it happen to us, too? 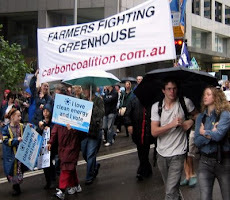 Could the Commonwealth Government ever 'nationalise' the soil carbon Australian landholders are capturing and storing and use it to meet international agreements while at the same time dishonouring them? 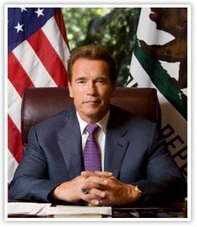 Even worse: could we be called upon to pay for emissions (because the official science believes they exist) yet be denied the right to sell our soil carbon increases (because the official science denies they exist)? While ever the official position is that agriculture is a negative activity for the environment, this will be the possibility. Until we prove agriculture can be regenerative and that high carbon scores correspond with healthy farm ecosystems, agriculture remains in the crosshairs. PS. 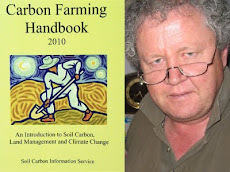 Dr Maarten Stapper, who is a great supporter of the cause of soil carbon, believes the reason why many no till croppers score low soil carbon increases is because they use nitrogenous fertilisers which 'burns up' the carbon. PPS. A big THANK YOU to Jill Moore-Kashima for your message of support and your contribution. "Onwards!" Many believe that regenerative land management is dismissed in official circles because of lack of peer-reviewed research showing its efficacy at putting away soil carbon, for instance. While this may have some truth, there is a larger problem. Reductionist, "effect of A on B" research will be unable to reliably account for the successes. 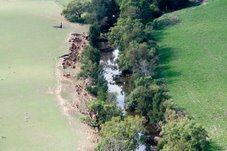 Regenerative land management is a black box to most, because they do not have the mental map of biospheric cycles and wholes such as the carbon cycle (which tends to be seen as sources and sinks, not a cycle) or the water cycle. Here in the U.S. we do have the work of Rattan Lal, but these figures are an order of magnitude lower than what is possible, as Lal's work deals entirely with conventional farming practices and categories.